That's Right. One gross of endcaps to make 24 more kites.. I should be well stocked for a while now. Paul, these are the Freilein caps, they only fit original Rev tubes prior to the total refit at Rev... They do not fit what Rev is producing now. I only use Skyshark to make frames anyway.. The "inny" type connectors that Rev uses now makes a rod with a small split completely unusable.. A cap that covers the rod can tolerate a rod that has a 1/4" split in the end and has been glued since it covers and stabilizes the fracture. Understood.. These fit Freilen, Skyshark and the older Rev Frames. I should be well stocked for a while now. At the rate you are going, "a while" will be a month or two. Where did you get them, if you don't mind me asking? 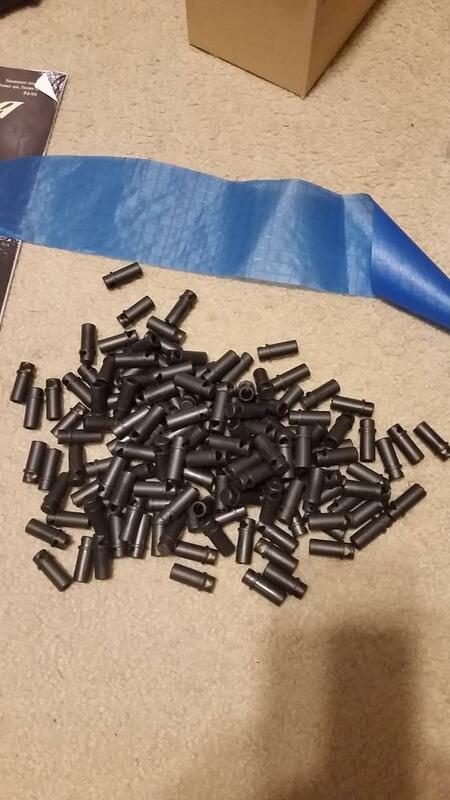 I'm working on a few quads right now, and I've never found any supplier where I can get a large number of Rev-compatible end caps (old-school Rev) for a reasonable unit price. Good luck with your work.. Remeber to share pics and vids here at KiteLife. Has anyone tried 3 or 4 wrap Rev rods in those caps? The ones that Bazzer uses are metric and will not use Rev rods in the 3 or 4 wrap size. You might get them on, but almost impossible to get off. 3 or 4 wraps will fit if you take a 5/16" drill bit and carefully ream them out. No issues with SkyShark. They do get tight.. I use Skyshark most of the time now but I have been known to sand the inside of the caps a bit if needed to get the fit I want.